Editor’s note: Though blunders, overestimations, flubs, and missteps always pop up, we brought back this article to help you identify what content marketing mistakes you can avoid (or fix). I lived by the quantity of content on social media. I manage five brands and was posting six to eight times on Facebook, three to four times on Twitter, and once on Instagram for each, trying to keep my numbers up and it was burning me out. I never had time to really consider the kind of content I was publishing. How to fix it: I began to publish less but took time to make sure the content I was creating and publishing was quality and would connect with my audience on a deeper level. My numbers soared even higher. How to fix it: Do quality, which takes more time but is far more worth the effort. Nobody can make anything go viral. It either happens or it doesn’t. I don’t create content for virality. How to fix it: Create content to be helpful. Brands often do content marketing on a budget that does not allow for true test and learns, for doing it the right way, yet then judge the results accordingly. How to fix it: Know when it simply isn’t worth doing if it isn’t going to be done well. Often, one or more people on the team may have separate KPIs (key performance indicators) in mind, and without a clear discussion, they can end up creating what they think is a great campaign but achieves the wrong objectives. How to fix it: Before starting, decide what you want to accomplish and design your content campaign and measurement around that objective to ensure that you’re all working toward the same goal. My mistake was oversharing and saturation of the same core audience. How to fix it: I now diversify who I send content to, and how often. Years ago, I told a professor that I didn’t feel qualified to write about a topic because I was unable to provide concrete answers to the problem. How to fix it: She told me that it wasn’t about knowing the answers, it’s more important to ask the right questions. I’m not a content marketer; but I’ve worked with a team to market my book. My biggest mistake was assuming the virtue of my work would attract an audience. How to fix it: I have to work hard to make people aware of my book, Good Charts, but it’s worth it. I love the big idea; but sharing the big idea and expecting others to immediately buy in is a fool’s errand. How to fix it: The key is to share your thought process first, then pitch the idea. About 15 years ago, I decided traditional advertising had to die soon because it didn’t make any sense in a digital world. If I knew then what I know now, I would have understood how the status quo resists change. How to fix it: Create and provide supportive services to help clients slowly transition from siloed analog organizations to integrated digital ones. “Voice of the customer” research creates commoditized content. Responding only to known or stated customer needs with offerings not dissimilar from your competition means the only distinction your content can claim is the logo of the company on it. How to fix it: Create an edge or uncertainty in your content to disrupt your buyer’s status quo bias and overcome the biggest barrier to success: your prospect’s aversion to change. Be original and fresh to create clear differentiation. A common theme in the mistakes I’ve made in content marketing is this: I did not understand the market well enough. I relied too much on the input I got from the companies until I realized that they rarely know what’s going on in the market. They may look at data or dashboards, but they rarely take the time to talk to their clients. You won’t find the right answers just looking at what you already do and know. How to fix it: I now require that I get to talk to at least two clients whenever I begin a new project. If that’s not possible, I conduct survey research or similar. It always brings new points to the table. We’ve all had the projects with never-ending scope creep. How to fix it: I use a comprehensive scope of work or project brief, as appropriate, to make sure all those involved in a project agree on deliverables and timelines, what success looks like, and what constitutes project completion. Our biggest challenges in internal discussions come from language confusion. How to fix it: Before a project, we use language boards where we compare SEO research on the terms customers use to the terms subject matter experts or stakeholders use. HANDPICKED RELATED CONTENT: 2019 SEO Keywords and Google: What’s in Your Poker Hand? We’ve all made the mistake of writing what we want to read (or what we think we’d want to read) rather than asking our audiences what they want or otherwise using data to drive content strategy. I’ve thoroughly enjoyed writing pieces that bombed in terms of ROI and groaned through others that performed exceedingly well. How to fix it: The lesson is to write for your audience, not for yourself. Hitting “publish” and sending an email that still says, “text here, text coming” isn’t exactly helpful to your 1 million-plus audience list. How to fix it: Always triple-check which buttons you’re clicking on when you’re editing an email newsletter, scheduling a blog post, and creating a social media post. Marketing technology is overrated. But changes in tactics have made a huge difference. How to fix it: I’ve learned I can often get better results updating an older article than by writing a new one. I wished I’d discovered that years ago. We focused on educating users on various aspects of visual content creation by writing tons of blog posts. Though there was good traction initially, things never really picked up. How to fix it: We got interesting feedback from a teacher whose students were more hooked to viewing animated videos instead of reading their textbooks. We opted to see if this preference worked with adults and started using more visual content. We created a lot of video templates and GIFs to directly help our users. We witnessed 10 times more traffic thanks to this strategy. You need to experiment a lot and innovate every year. One of my most difficult lessons has been that good writers don’t automatically make good content marketers. The ability to convince and cajole an audience to take a brand-specific action while still delivering value on a consistent basis is hard, and it takes more than the ability to craft a pretty sentence to get it done. How to fix it: I interview content marketing candidates differently, looking for their insight into the audience, conversion optimization, and marketing objectives more broadly instead of focusing heavily on their writing sample. When I first started out at Monster, I assumed a big portion of what we’d do for content would be labor market news. But I quickly realized from looking at our analytics that our audience didn’t care about macro trends, they wanted information to help them specifically with their job search. How to fix it: While we still do some news, it’s always driven by the takeaway for the article – is this something our reader can act on and, more importantly, wants to act on? When we first developed a content marketing strategy we didn’t have a perfect strategy. We knew we wanted to engage prospective customers and build our audience. How to fix it: We recognized starting now is better than waiting and starting perfect. In the first year, our primary success metric was the share-ability of our content. In the second year, we focused on increasing the quality of our content and optimizing distribution strategies. It wasn’t until the third year that we could show success in generating leads and support for social selling. Content marketing was an evolutionary process for us. I didn’t build my email subscribers list early enough or focus on segmentation. How to fix it: I now focus on email subscribers as there is nothing more valuable in the business. I also have segmented that list based on the challenges and needs of my audience – so I can tailor my communication to fit those audiences. It makes it much easier to get super specific with your content. 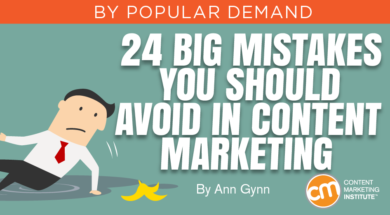 If you’re afraid to make mistakes in your content marketing, the best advice from these experts comes down to a single step: Don’t be. Don’t make the mistake of missing out on Content Marketing World 2019. How to fix it: Hear from these experts and dozens of others in 200-plus presentations. Register today and use BLOG100 code to save $100.